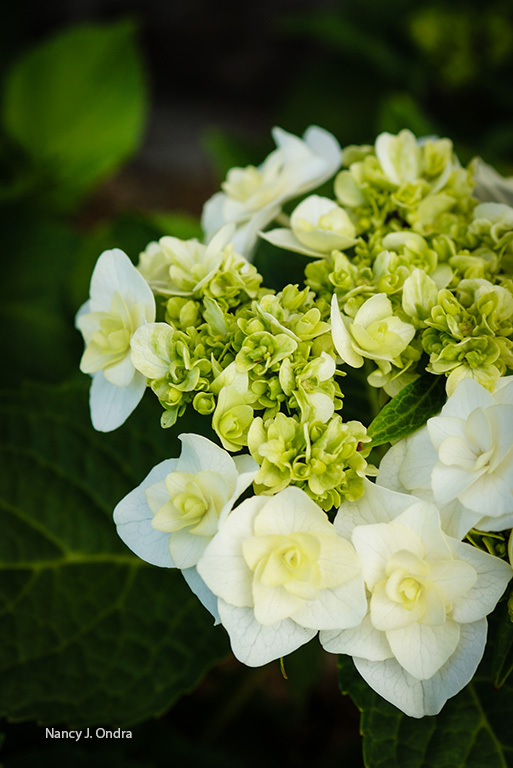 White-flowered hydrangeas are just right for a night garden. It’s summertime, and the living is…well, it’s just plain hot. It’s not much fun puttering around outside during the day, but the evening hours are a different story. Once the sun starts going down and the air cools a bit, the garden is much more tempting, whether you want to catch up on some weeding or deadheading or–better yet–just relax and enjoy the sights and scents. You can easily enhance the enchantment factor of your vespertine views with a bit of planning and planting. Concentrate your efforts on spaces where you know you like to relax: around a patio, for example, or near your favorite garden bench. You could create a new planting specifically for evening interest, but that’s not necessary; it’s easy enough to tweak an existing garden area for nighttime enjoyment. Spot a few evening-feature plants among existing ones in a bed or border, or bring them right into your outdoor living spaces with pots and planters. First, concentrate on color–or rather, a lack of color. White flowers catch even the tiniest bit of light, showing up long after darker blooms have merged into the moody dusk. 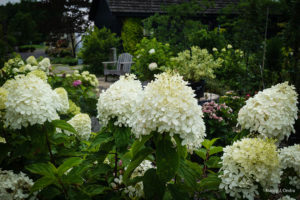 There are many outstanding whites to choose from for mid- and late summer: various hydrangeas, for instance, such as the big, ball-shaped blooms of smooth hydrangea (Hydrangea arborescens), the cone-shaped clusters of oakleaf hydrangea (H. quercifolia), and the lacy heads of Wedding Gown bigleaf hydrangea (H. macrophylla ‘Dancing Snow’). For perennials, think of pristine ‘David’ summer phlox (Phlox paniculata), spiky Culver’s root (Veronicastrum virginicum), and bold ‘Becky’ Shasta daisy (Leucanthemum x superbum), to name just a few options. Many wonderful white-flowered annuals start flowering around midsummer, and they’re ever so easy to tuck into empty spaces left by early bulbs and spring ephemerals that have retreated underground to beat the heat. 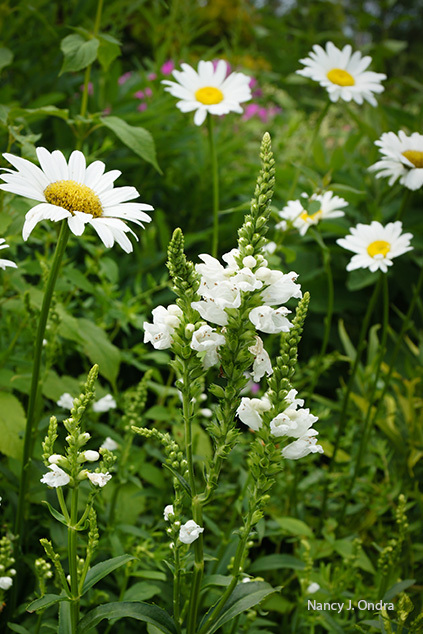 A few of the many gems to look for as seeds or transplants in spring to early summer include ‘Purity’ cosmos (Cosmos bipinnatus), ‘White Queen’ spider flower (Cleome hassleriana), and white lace flower (Ammi majus). 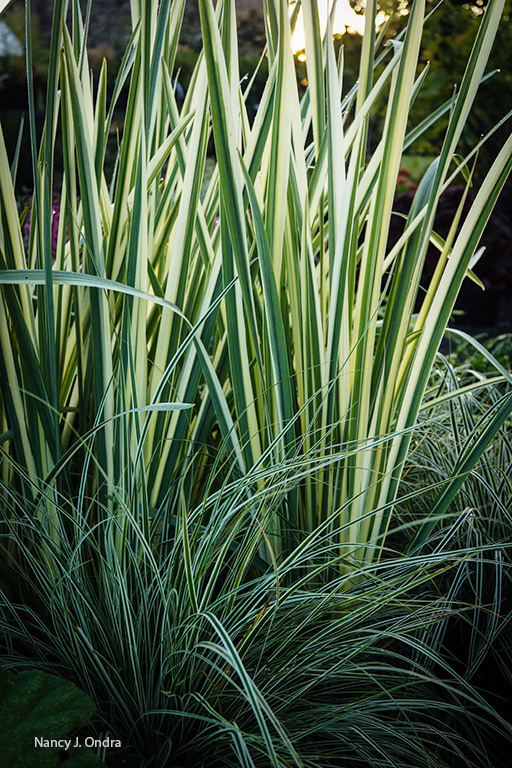 Other pale possibilities to consider include any plants with pale yellow blooms, bright silver foliage, or white-striped leaves, such as variegated Japanese iris (Iris ensata ‘Variegata’). 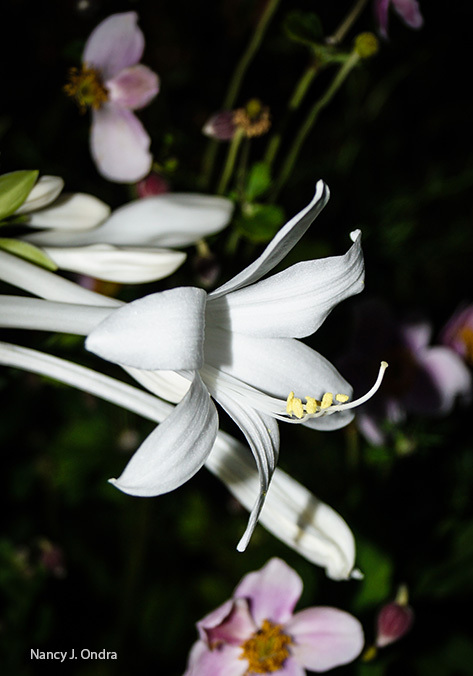 Plants with light-colored flowers that are also fragrant add an extra level of pleasure to evening plantings. 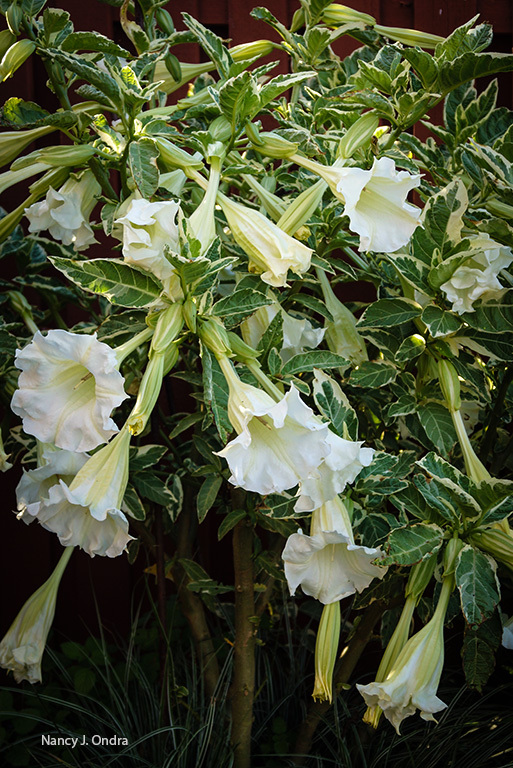 The big, flared blooms of angel’s trumpets (Brugmansia) are gorgeous in large pots, and moonflower (Ipomoea alba) readily climbs trellises, arbors, and pergolas if there are wires or other slender verticals for it to twine around. Snow white ‘Casa Blanca’ Oriental lily (Lilium) and perennial plantain lily (Hosta plantaginea) are also excellent choices for scented summer flowers, assuming deer aren’t a problem in that part of your yard. 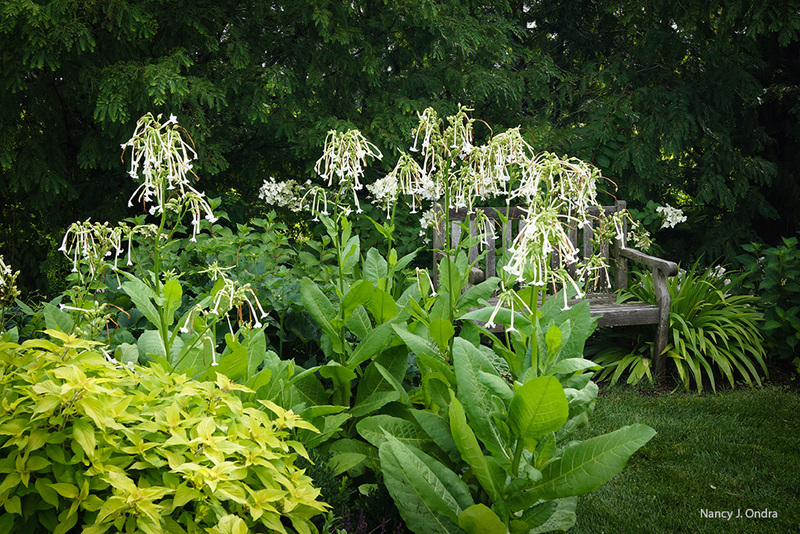 Woodland tobacco (Nicotiana sylvestris) is annual but readily reseeds, so you can sow it once and have it for years. Flowering at 4 to 6 feet tall, its perfumed blooms will attract your evening guests but are rarely appealing to deer. We still have some great plants available at Linden Hill Gardens, but they’ll be gone any time now, so stop by soon to look for a few new things to enhance your summer evenings. Then take advantage of your gardening down time to start thinking about what you can add next year. Bulb catalogs should start showing up any day, seed catalog season will arrive before you know it, and it’s never too early to start making your must-try list for next year’s perennial, shrub, and tree purchases. We wish you wonderful midsummer night garden dreams! Our End-of-Season Sale is happening now through July 29th 10am-6pm daily!